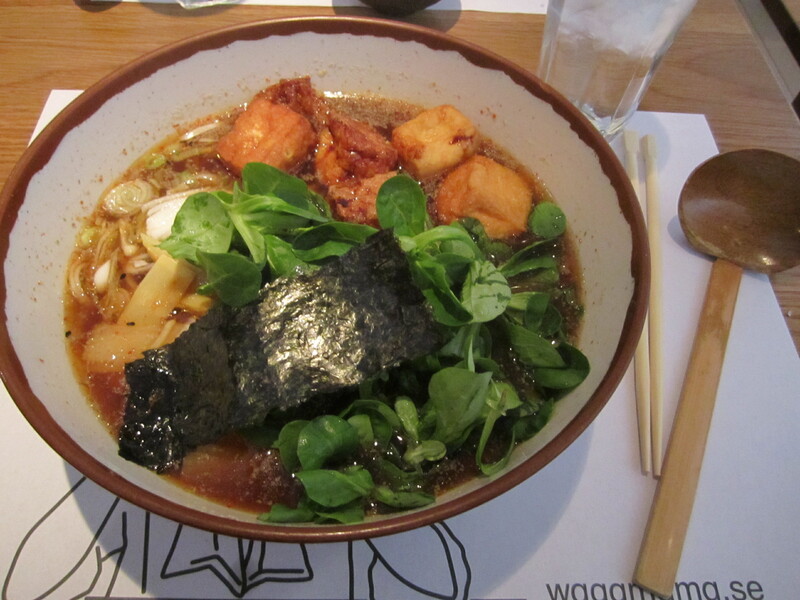 When I was researching my winter trip to Ireland, the number one restaurant I was advised to check out was Wagamama. This Japanese noodle house was actually started in London’s Bloomsbury, inspired by casual ramen bars. I caught a midnight noodle craving in Ireland, hoping to pick up some soba noodles past dark. But my New York City attitudes were not at home in a city with a bedtime: I missed my chance to sample the full dishes, and instead picked up some plain rice noodles as the kitchen was closing. I had not gotten the full experience, so when I came across the inviting noodle shop in Sweden, you bet I had to try it out for real. My mom tried out a twist on your traditional teriyaki chicken. A little bit of chili spice added some unexpected zip to this noodle-based dish. 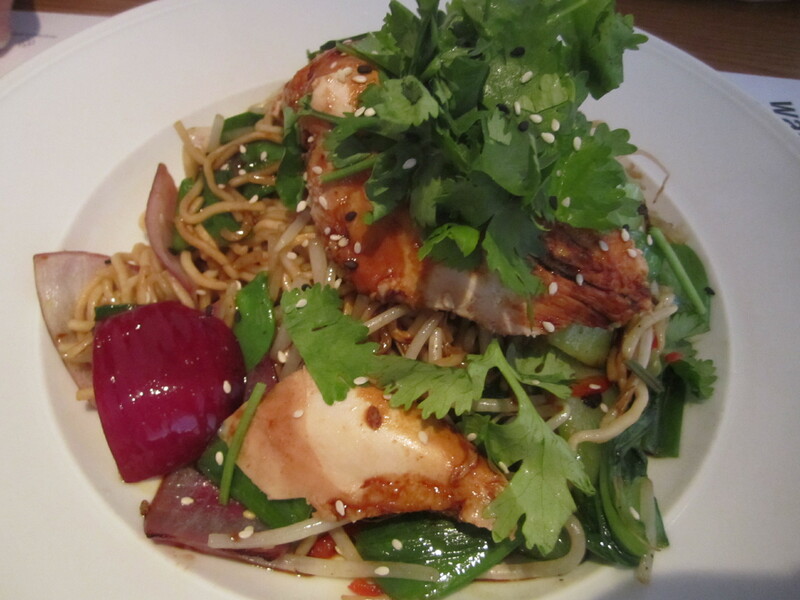 Usually chicken dishes comes with a side of noodles, but these soba noodles stole the show. “Not your take out noodle joint,” says mom of the place, even though you can take your meals to go if you want to enjoy the dish on the go! You know that you’re in for quite a dinner when your waiter brings out a wooden ladel for you to eat your soup with. My ramen dish came in the biggest bowl I’ve ever recieved. I guess I couldn’t take a cue from the happy slurping man on the restaurant’s logo: this dinner was going to require some heavy duty utensils. I couldn’t decide if I wanted a noodle dish, soup, or salad, and this one combined all three. Light on the sesame seeds, you get a hint of the teriyaki flavoring without it being too overwhelming. Piled sky-high with fresh greens, scallions, seaweed, ginger, shallots, and teriyaki-fried tofu, this soup was a great combination of everything Wagamama has to offer. There are three Wagamama locations in the United States so far, all in Massachusetts. Check them out if you’re looking for some surprisingly authentic international eats!